For the working girls, here’s another business casual look for you. If you want to be taken seriously at work, you have to dress the part. Agree? But in order to do so, there’s no need to break the bank. Get resourceful. Look for stores that sell fashionable clothes at an affordable price, like Details! Don’t just limit yourself to stores that specialize in corporate wear. Stores like Details are great places to scout for clothes that are appropriate for both work and play. This way, you get the most out of your money. Plus, you don’t have to worry about what to wear to a party after work. Invest in separates you can easily mix and match with other pieces, no matter what the occasion. 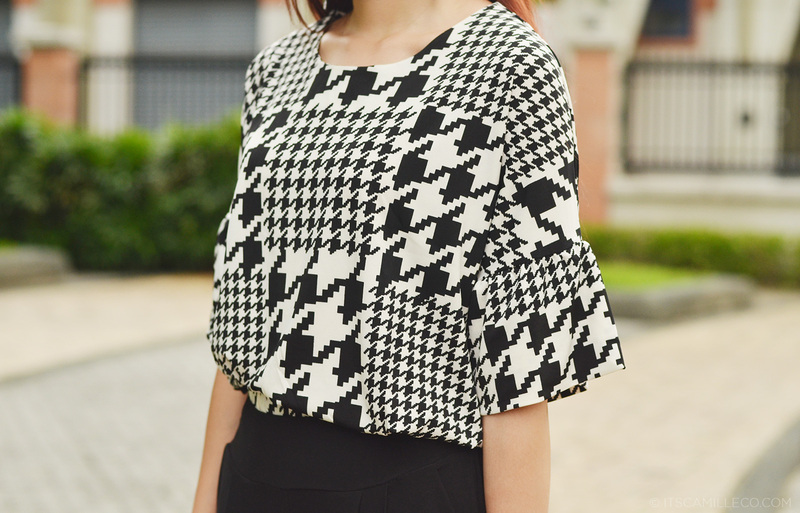 Take my houndstooth top for example. It’s in a classic print and color so it’s easy to style. At the same time, it’s an eye-catching piece that can spice up your work wardrobe. Bonus points because it even has cute little ruffle details on its sleeves. Yes it will, for sure! :) Thanks Christine! 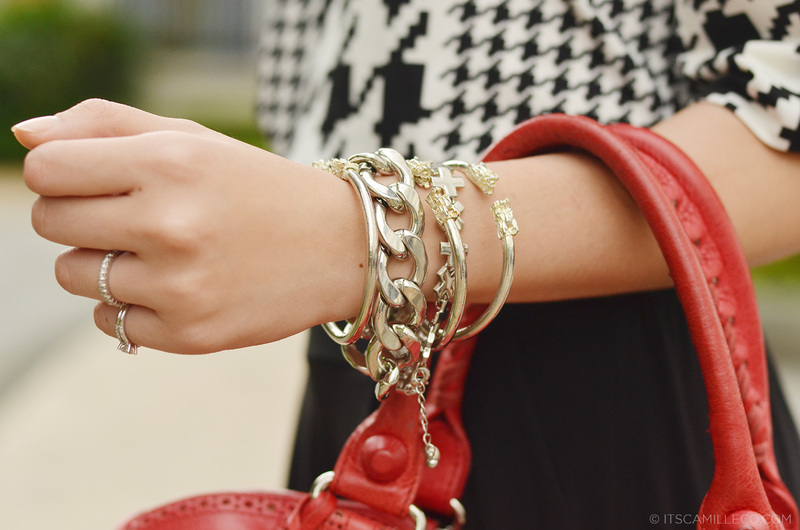 Love that houndstooth top! It would be great to see what other ways you would style it, perhaps with something colored? Yes! :) That would look great as well! I would like to ask how much does the pants cost? you look sooooooooooooo tall. o_O as in super tall talaga. The Wang heels are stunning on your feet, as always ! I love the pants. The wide leg makes you look tall and is great for petites and skinny people. It’s nice when you can transform a work outfit into a night out. Wow! I really love your top! Hey ate Cams. Just curious, heavy ba yang bag mo cause marami ngsabi na mabigat dw yang that kind of balenciaga bag? I really love the black,white, and red combination. I am sooo in love with this!!!!! Ganda ganda!! Very classy!!! ^^ I like your hairstyle too!!! Grabeee! ang tangkad parang si daddy long legs. haha, I can see those AW babies rock again! Aww thank you to hubby as well! Cute yang baby na yan! :) Haha! Haha! You can wear heels naman! Another great outfit! Not that I expected anything less from you <3 Who knew work attire could look so chic? You looked taller Cams. Although I know you already are. 5’7″ right? :) Loved this look. Hooray for the working girls! More please? Hehe… And your bangs!!!! Sidepart suits you well. Ano ba yan everything suits you well. clothes, hairstyles, shoes. lahat na! IKAW NA! Trust me. Walang galit yun. ;) Parang Tito Boy lang ang peg. Hohoho. You look so tall and so pretty with that kind of hairstyle! I love the no bangs camille!